A new, composite word – “glamping”, a short form of “glamor camping” – has been popping up all over the landscape lately. People who never thought about camping before are now hooked on enjoying nature, only in full comfort and with an almost decadent style. When you want the best in luxury camping, you need look no further than the high-end models of motor coaches being produced right here in Oregon. These finely designed homes on wheels allow people to enjoy the beauty of the outdoors while returning each night to luxurious accommodations. Modern customization trends can create an air of exclusivity and ensure that one will never find oneself parked next to an identical RV. Imagine yourself glamping in a “land yacht” that contains all of your meets modern styles and materials. 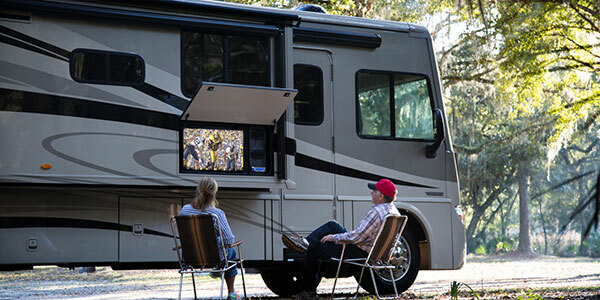 Today’s luxury RVs are packed with details ranging from classic, rich leather furniture to complete kitchens to ultra-modern hi-definition television screens. There are necessities and luxuries included in today’s innovative coaches. They often feature video security cameras, iconic Bose® surround-sound systems, CD/DVD and Blu-ray players as well the tools needed to get video reception almost anywhere you go. Those things are definitely nice, but what makes today’s coaches truly special are that everywhere you look, you see attention to detail – a spa-like shower, heated tiles in the kitchen, bathroom and living areas, shining wood surfaces, stainless steel backsplashes – even the ceilings have certain designer features. People who choose the glamping life don’t ever need to compromise on comfort. With full-feature baths and showers, a king-size bed, washer/dryer and even an exterior entertainment center, the living is more than comfortable. Of course, there is a tremendous amount of storage so people can bring plenty of gear as well as clothing for multiple seasons when they choose to leave their traditional home for extended travel. A keyless entry with doorbell and touch pad can provide peace of mind and convenience. And the lighting in modern RVs can be controlled to absolute perfection. There are a myriad of other features that make travel simply elegant. When all of these features are in place, a motor coach makes the kind of statement that only those with a true taste for luxury are bold enough to make. This is glamping at its best.